Shires Oak Buildings are passionate about oak creations as specialists in the design and construction of oak framed structures. 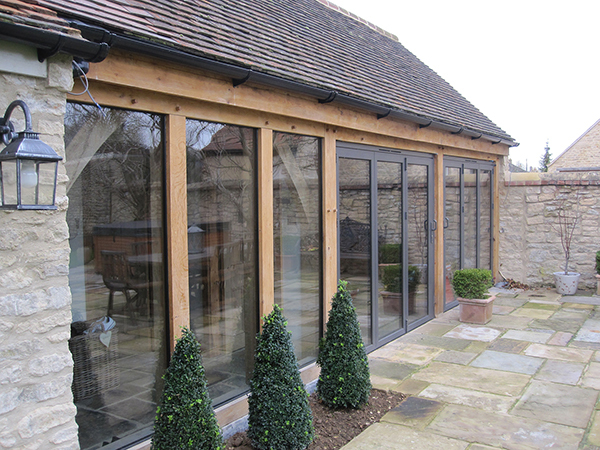 In this blog, we would like to talk you through reasons to invest in an oak framed extension. Shires Oak Buildings use oak for its durability. Good durability is very important when creating any building as it predicts the ability of the structure to withstand wear or damage. The strength and durability of oak means your extension will last for hundreds of years. Oak is very versatile. It is perfect for the bespoke ideas you may have for your oak framed extension because its high versatility allows it to transform into complex shapes. The use of oak in your extension can mean a speedier development than using other building materials. Shires Oak Buildings believe that oak frames are installed quicker than other constructions; therefore, traders such as electricians and plasterers who are also working on the site can start their work much earlier. Your whole project is completed quicker, so you can enjoy your extension as soon as possible. Oak can be easily insulated to a high level, and can be clad in stone, brick, weatherboarding or slate. This allows a good thermal insulation to be achieved. Oak framed extensions allow for high levels of noise and sound insulation. You may be using your extension as a place to study or spend some quality time with the family. By using oak, you will not be disturbed as it has great noise and sound insulation. The quality of oak we use at Shires Oak Buildings is excellent. We choose oak in particular because it is unlikely to rot, and our customers get the best quality extension. If you are worried about an oak framed extension looking too traditional against your modern home (or vice versa), don’t be. Your extension can be as traditional or modern as you like, and Shires Oak Buildings work to meet your needs and wants. Have a look at some of our recent projects here for some inspiration. Oak is eco-friendly and has many environmental benefits.. Your oak framed extension will not only be sustainable but have a positive impact on global warming. We are a little biased, but oak is a beautiful building tool. Shires Oak Buildings will work hard to get your oak framed extension built exactly how you want it. Shires Oak Buildings are happy to help you with your oak framed extensions or any other projects. Please do not hesitate to contact us by calling 01926 612812 or emailing us at info@shiresoak.co.uk.